Patients want to trust their provider to not make mistakes and to not lie to them. Unfortunately, when it comes to guns, medical organizations have not been living up to that expectation. 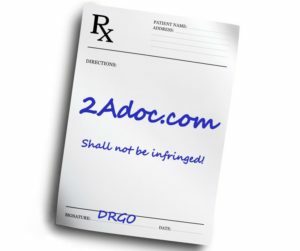 Medical associations have been insinuating an anti-gun political agenda into the patient-doctor relationship for decades. Patients are routinely being asked about gun ownership. Worse, many physicians commit boundary violations by pressing anti-gun messages on patients. This issue is a continuing nationwide problem. The case of my 90 year old, bed-ridden mother-in-law who lives in a nursing home in Los Angeles illustrates the extent of the problem: Just recently, she was taken to an off-site specialist consultation. The paperwork my wife had to fill out included questions about the presence of firearms in the home. Personally, I would prefer that there are firearms in the nursing home where my mother-in-law stays. The patients and and their caretakers are vulnerable soft targets. That aside, what in the name of all that is sane does the question about firearms ownership have to do with an evaluation of a feeding tube in a 90 year old, non-ambulatory nursing home resident? That question is absolutely irrelevant to her care and not warranted by her history and clinical picture. As demonstrated in a recent study from Jane Garbutt, MB published in the Journal of Pediatrics, a physician’s opinion on non-medical matters can hold a lot of sway with patients. Gun owners are unlikely to follow the advice of physicians who urge them to get rid of their guns. People who are not gun owners (and, thus, less likely aware of concerns over the validity of doctors advising about guns) are more likely to follow their doctors’ advice. The ramification of that happening on a national scale is concerning to those who care about the Bill of Rights.